The quashing of a conviction for gross negligence manslaughter is rare. The case of Dr David Sellu one of a small handful in UK history. It must be of importance to all who study or are involved in law. References and supplementary materials/links follow. To get an overview of this historic case all you need do, is listen to Dr Sellu in video. For the avoidance of doubt or any possible sneaking suspicions, I have no sort of relationship to the doctors mentioned (re: GNM) and I'm not defensive of my profession. On the contrary, I'm usually rather critical. This is not just about doctors! There is some supplemental information at the end which may not immediately appear relevant. What's important? Two cases of gross negligence manslaughter (GNM) by medical doctors. But of major interest should be that the case of Dr David Sellu is one of a small handful in UK legal history, where GNM has been quashed. 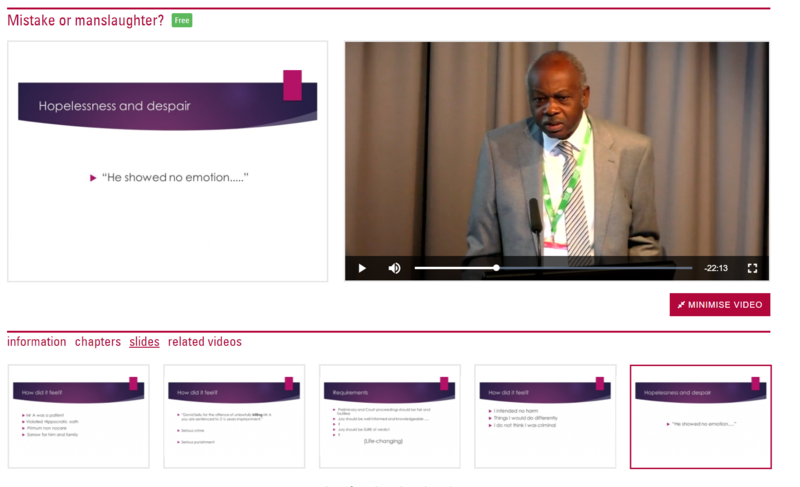 The sad situation of Dr Sellu is outlined in his presentation to the Royal Society of Medicine in April 2017. He takes us from day one, into investigation, the courts, prison and then the aftermath in 31 minutes covering over 3 years. The second case involves a junior doctor who was convicted of GNM in 2015. The General Medical Council submitted to the MPTS that she be struck off completely. However the MPTS (which is effectively the GMC's own Tribunal, not being part of HMCTS) was not impressed. They ruled that that she should resume work once her suspended sentence expired. A sound summary of the case is to be found at New Statesman (Nov 2017). The salient issues arising from these cases are too many to list. My imperfect nutshell summary is that professionals working in health services - especially at this time of crisis and near breakdown - ought to know that from several different angles, that system failures which effectively make negligence more likely are not likely to be given the full light of day in court rooms. The issues at court are between the State and the Individual, NOT between the State and the organisation. Issues of 'mitigation' are quite separate to matters of 'defence'. GNM could catch anybody out! Some say, "Not anybody", which would mean the 'system issues' are not well known by those or a string of cases such as Dr Raj Mattu. [£14 million spent by Trust]. Why is Raj Mattu relevant [and I don't know the man from Adam]? Cuz, when we speak up and attempt to do something, we could be hung out to dry. Some say this is a rare and unrepresentative occurrence. 'Some' are not working in the health services to know what 'the system is' from the inside. Mindful of the above, my own experience of witch hunts and references below, I am now satisfied that my will to self-preservation, my OCD, mistrust and paranoia are entirely justified. I remain comfortably untreatable i.e. it's not me that needs treatment! I require no sympathy either. I apologise if any of my colleagues have been upset by my sarcasm and cynicism. I mean you no distress/stress at all. Reality is a hard place. Court of Appeal Judgment on Sellu 2016. Court of Appeal quashes GNM conviction of optometrist 2017. The principles in negligence law and GNM apply to everybody - not just doctors. Thanks for posting this - interesting and important for anyone concerned about our creaking NHS hulk. I had intended to reply to your original post re the Bawa-Garba case, but had, well, procrastinated. I very much agree with your points. that the mitigating factor of the 'system failures' was afforded too much weight, setting an unacceptable precedent. #3 above is especially tasty for the crocodile. In effect saying, as you suggest, that no matter what the level of disarray, staff must simply accept that if they err at all they can expect the harshest of penalties - paying the price of political neglect of the NHS. It's no wonder that the case has become something of a cause celebre both inside the profession and beyond. Crucially, the MPTS has to make an often difficult judgement about the future risk, if any, which the errant doctor poses. There's more I wanted to say about the Bawa-Garba case, but I think you've largely covered my own thoughts. I haven't looked at your new material, but I look forward to doing so and responding - hopefully before 2018! Thanks for giving it some thinking time. Negligence law is gonna become terribly more important over the next 10 years. Budding/aspiring legal bods should watch this space. The NHS is about to crash - a Ponzi scheme of sorts - being propped up by grudging cash injections - having been strangled in the previous 5 years. Staff in various areas will be under far more pressure/stress and errors falling into the domain of 'negligence' are likely to become more common. I can't blame victims for suing, cuz I usually say, "Sue their socks off!" - meaning organisations more of the time. The areas of 'defence' are likely to become equally or possibly more important, for individuals. Professional persons are also likely to need far more representation at various sorts of hearings. Legally qualified persons will be in far greater need I expect. The law at the moment holds institutions to account on criminal charges of Corporate Homicide/Manslaughter, whilst GNM seeks out individual practitioners. So the 'equation' is for employers to push liability down onto individuals - that's the big issue in the backdrop. [I'm not talking about doctors per se]. Having read the Sellu judgment I am appalled... appalled that a surgeon who made so many incompetent mistakes, was let off on a technicality (error of the judge at first hearing made summing up unsound). The other cases have pockets of guilt as well, no one is as pure as the driven snow. Overreach of the GMC? Maybe. But in the end, I am all for doctors having to cover their arses and be waaaaayyyyy more careful. I'll even make my own complaints loudly. I too am appalled by what went on. Some say 'all are equal before the law' but some don't like it when the rules don't work for their sense of justice. Hence they shout, "Technicality!" Innit? Except that the 'technicalities' in Sellu's case happened to be a major cockup by a judge on issue of causation. Some may need to do some further reading to discover what causation has to do with negligence (in law). Some may also need to learn more of the issues about instructing a jury (by a judge). This is often referred to as 'technicality' - but 'he's guilty anyway' - when the so-called technicality is actually the crucial factor related to the outcome of a jury's decision. 'Technicality' is a word often used by those who are their own personal judge and jury. To reiterate - even if to cause paradoxical 'suspicion' - I said, "For the avoidance of doubt or any possible sneaking suspicions, I have no sort of relationship to the doctors mentioned (re: GNM)." JTBC - I do not know Sellu from Adam. I do not identify with the man. I do not support the man. I couldn't give a monkeys if he was actually Prince Harry in disguise. Sellu may have committed acts of gross negligence (which is a tort). The slippery slope is composed of the criteria which turn a 'tort' into a criminal act of gross negligence manslaughter. Some may need to wait a while, to study the insides of 'criminal law'. There are serious legal issues in this case to be discovered and appreciated. However, any speed reading and lack of depth of understanding of the legal issues, is likely to lead to the case being treated like 'pearl before swine'. hey, it wasn't me who said the judge screwed the pooch. It was the CoA.... and I happen to agree with them because they provided sound reasoning. And they provided a whole plethora of Sellu's failings... so again, I reiterate my point... let doctors watch their Ps and Qs, cause I won't take their failings lightly. My own skim reading of the judgment suggests that issues of causation were dismissed as grounds for a successful appeal (at 128). However, the appeal was allowed for equally serious and important reasons (129-156). Essentially, the trial judge ‘did not repeat the important direction that what was gross negligence was a matter for them and not the experts’ (155). ‘The key is that the breach of duty must be gross. It must have been so bad, so obviously wrong, that, having regard to the risk of death involved in it, it can properly be condemned as criminal’ (R v Adomako 1995 quoted at 151). A number of other leading cases are cited to support and explicate this vital point. It’s vital, but easily missed. The danger is that juries, having waded through expert medical evidence and legal direction regarding causation, come to a point where they breath a deep sigh of relief, pat themselves on the back, and leap rapidly to wave through gross negligence – a serious crime. This goes to the very heart of the offence and is far from being a ‘technicality’ in the usual sense of some rather shabby lawyerly cavilling and knavish trickery. What I take from the examples given by CW in his original post, is the failure of the GNM charge to take account of systemic failure as a significant defence and the continuing inadequacy of whistleblowing protection: individual culpability with little or no corporate responsibility This is not about GMC ‘overreach’ – save, possibly, as a postscript to the Bawa-Garba case; we’ll have to see how that one develops. by Theodore Dalrymple, a retired psychiatrist, writing with his usual cogency and wit. He outlines some of the perils of GNM in the medical context. I support Mohan’s right to make his ‘complaints loudly’, but I also support the rights of the practitioners to proper justice. At present, it seems, there are serious flaws in the law and its implementation. Skim reading law is dangerous. Well observed. Lay people, doctors and even lawyers make a serious mistake in thinking that "It's just ridiculous and bad, he's guilty!" Hence directions to juries become extremely important. Forgive me for banging on about 'psychology' again, but people are often driven by their 'feelings and emotions' instead of applying the law and the rules of logic. What I take from the examples given by CW in his original post, is the failure of the GNM charge to take account of systemic failure as a significant defence and the continuing inadequacy of whistleblowing protection: individual culpability with little or no corporate responsibility. What one takes may be subject to the natural problems with skim reading. I was careful to separate mitigation from defence. I don't know that systemic failures can be taken into account in any part of the trail process. I would have thought that those failure were more a matter at time of conviction. In other words the 'meat grinder' will do its job by grinding very finely. How hard the minced meat is allowed to fall into a bucket (aka prison) is a different thing. Oh dear - I do like these sort of graphic descriptions - don't I? This is not about GMC ‘overreach’ – save, possibly, as a postscript to the Bawa-Garba case; we’ll have to see how that one develops. Absitively! Posolutely! The law on GNM was developed and grew out of a soil that was not nearly as complex as it is today. The courts have wrestled with other sorts of cases in the 'civil' domain as well. There have been reversals of doctors being struck off for example - and judges realising to themselves how they too have been set up by what they're fed in the court rooms. You can't blame the judges of course, cuz they can only deal with the evidence in front of them. Stuff rises from the 'trenches', is filtered and presented in court. In that process hundreds of minds are working at times unknowingly against the accused (civil or criminal cases). Sellu, in his presentation pointed to what he believed was a misunderstanding by the CPS which caused the case to swing in a strange direction (to him). [I'm using those sorts of words cuz I don't know the insides of the case and wish to remain impartial.] The 'lesson' to extract from that part of Sellu's presentation, is that people infer meaning into words on a page - without understanding context. As I've said so many times 'context is everything'. I'm in partial agreement with Mohan that doctors need to watch their P's and Q's. Well, it's the same if you're a bomb disposal expert. The inside word is that health services have become a minefield with 'bombs' littered all over the place. A few doctors get 'blown up' now and then cuz there is a statistical probability that in such an environment they'll miss a P or a Q etc. This is not to imply that doctors are doing a great job. I happen to see what they are doing across a broad spectrum of work, and I'm most dissatisfied. So - I dunno - maybe it's also fine if a few are 'blown up'. But on the other hand the 'austerity' measures applied to health services these days ought not to be creating minefields for health workers. Tha's just plain nuts. the 'technicalities' in Sellu's case happened to be a major cockup by a judge on issue of causation. In our judgment, the way in which the judge left causation to the jury does not lead to the conclusion that this verdict is unsafe and these grounds of appeal (both in relation to causation and Brown) fail. There was discussion galore about causation, but ultimately it was rejected as a valid appeal. Of course there's plenty to pick over in rest of the judgment, and the obiter material on causation may well be useful in future cases; but it is not the basis of the appeal's success. What one takes may be subject to the natural problems with skim reading. I was careful to separate mitigation from defence. And I was careful to acknowledge and quote your original comment on this in my first post on Dec.2nd. I absolutely agree that taking direct account qua defence, of systemic failure in GNM is difficult, impossible or undesirable. I read your comments in 3 posts as highlighting (amongst other things) a potential disequilibrium of justice e.g. The law at the moment holds institutions to account on criminal charges of Corporate Homicide/Manslaughter, whilst GNM seeks out individual practitioners. So the 'equation' is for employers to push liability down onto individuals - that's the big issue in the backdrop. ... from the examples given by CW in his original post, is the failure of the GNM charge to take account of systemic failure as a significant defence and the continuing inadequacy of whistleblowing protection: individual culpability with little or no corporate responsibility. What you 'took' seems to be an your interpretation of what I said. None of my actual words referred to systemic failures being taken into account as a defence in GNM prosecutions. It's not a failure - it's just the way the system is. This is similar to the concept of 'absolute liability' - where the law will (in rare instances) find one guilty regardless of how one ended up committing a criminal act. [Similar to but even harsher than 'strict liability'.] I do not suggest that GNM is the result of 'absolutely liability' convictions. My imperfect nutshell summary is that professionals working in health services - especially at this time of crisis and near breakdown - ought to know that from several different angles, that system failures which effectively make negligence more likely are not likely to be given the full light of day in court rooms. The latter meant nothing more than the words in there. Nothing in my statement referred to anything about defence or mitigation. All the statement says in simpler language is that (paraphrasing myself), 'troubles in health services are not the object of focus in a court room when one is being prosecuted for GNM'. The reason for that is precisely that those considerations are normally left to the pleadings in mitigation - when one has been criminalised (aka found guilty). In more simple words, the system sets up people to fail but any body of evidence about how people were set up is not a focus for the court in terms of forming an excuse. In even simpler words, people are made symptom-bearers and whipping boys/girls of a sick system. The law at this time doesn't give a monkeys how one come into it's jaws - it'll simply savage one's posterior. On a separate but related note, today I heard from a doctor who was at court hearing the GMC put forward it's arguments against Bawa-Garba being 'let off lightly' by their own MPTS (tribunal) - not being fully struck off - as the GMC would see it. I mused over what he said. In essence he's discovering how harsh the law can be, and how seemingly relevant stuff is weeded out from court rooms. What you 'took' seems to be an your interpretation of what I said. None of my actual words referred to systemic failures being taken into account as a defence in GNM prosecutions. It's not a failure - it's just the way the system is.... I do not suggest that GNM is the result of 'absolutely liability' convictions. In even simpler words, people are made symptom-bearers and whipping boys/girls of a sick system. The law at this time doesn't give a monkeys how one come into it's jaws - it'll simply savage one's posterior. I do know the difference between defence and mitigation. My inadequate exegesis was the result of lazy writing, and had nothing to do with the 'skim reading'. In matters of law, I've learned the hard way - not to assume anything or be extremely cautious about making inferences. 'Lazy writing' (aka 'skim-writing') also not on, in matters related to law. People's lives can be in the balance, as so much rests on words on 'pages'. I know we're talking just in 'yet another forum'. I rather unlikeably to some of my so-called colleagues (elsewhere), approach matters of law in perhaps a bit too seriously a matter, wherever I roam. The above lessons have led me to be called 'thick' on occasions when I've asked what seems to be about 'obvious issues' - normally assumed by other people. On other occasions I've been labelled by so-called friends and family as has suffering with Aspergers and or OCD. I have a problem switching off my legal brain and saying, 'Oh right.. now I'm in lay person mode so I'll be as thick as the next person'. Once Kahneman gets into you (aka me), there is a problem.